Exclusions may apply. For active duty and dependents. Military ID required. No coupon necessary. Valid at Panama City Mall. necessary. Valid at Panama City Mall. Only for Service Member, not dependents. Military ID required. No coupon necessary. Valid at Panama City Mall. $10 OFF EYE & CONTACT LENS EXAM at Optometrist on Memorial Day and Veterans Day! Military ID required. No coupon necessary. Valid at Panama City Mall. Active Duty only. Only the military member qualifies (no family members). Military ID required. No coupon necessary. Valid at Panama City Mall. Valid at Panama City Mall. See store for details. *Excluded refurbishments. Military ID required. No coupon necessary. Valid at Panama City Mall. See store for details. 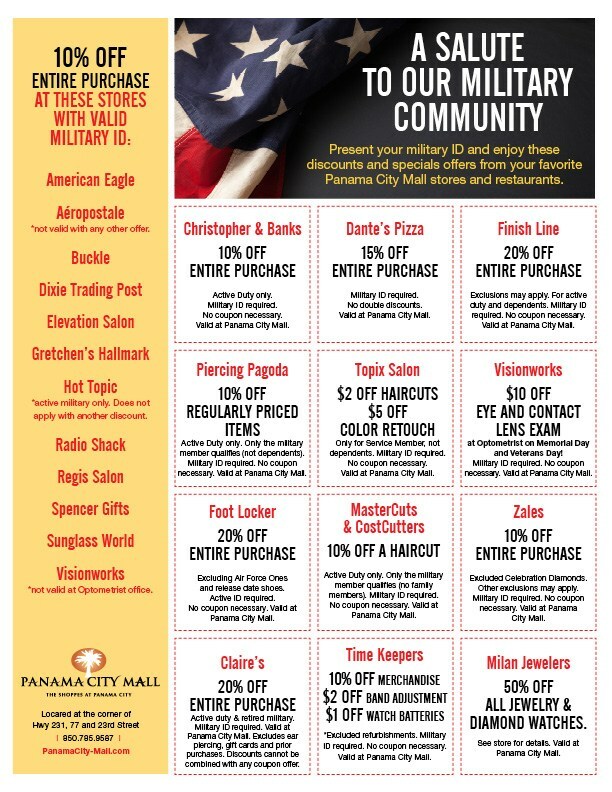 Valid at Panama City Mall.